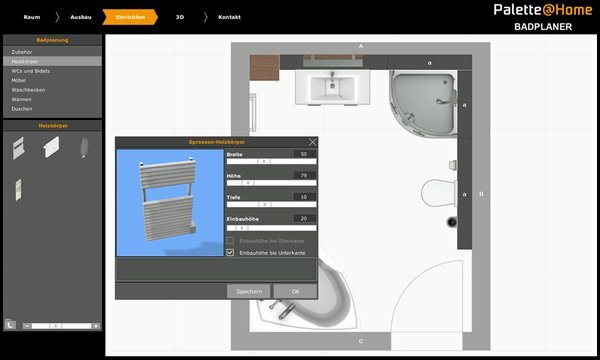 Palette@Home is a new app developed by Palette CAD GmbH, the number 1 in planning 3D interior design. It was created to let you, the user design any kind of room. Redesign your bathroom in just a few minutes or let your imagination run wild when reorganizing your living room. Would you like to fulfill a long-term wish of owning a cosy stove? Palette@Home is the ideal app for you. 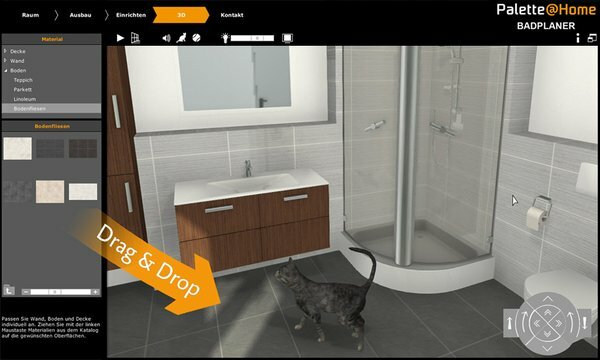 The virtual design app Palette@Home leads the user intuitively through all the stages of the planning process from start to finish. This begins with the definition of your rooms cubic measures and continues with the placement of doors, windows and if desired even front wall installations and pitched roofs. The clearly organised objects are readily available and can be dragged into the plan and positioned easily and quickly. The objects can also align themselves to the walls automatically. At any time you can switch into 3D mode and freely move about and examine your room. You can now explore your room in real time while accompanied by our company cat, - the “Palette-cat”. The immersive feel and quality of the graphics are impressive. You can also save your plan and import it into our PC program Palette CAD and from there to our other apps Palette MOVE and Palette PLAY.